Within the gas fields of Moomba, there are a number of large steam generating boilers that provide process steam to plant. During a routine inspection of boiler 10 an operator discovered a significant steam leak from a main steam pipe that resulted in the immediate closure of this boiler and a significant drop in gas production. HRL determined the root cause for this failure and provided the welding and engineering expertise to repair this major component and return it to service. A 250 mm diameter alloy steel main steam pipe containing superheated steam failed, leaking high temperature steam onto a walkway. This resulted in the immediate shutdown of this boiler and a signification reduction in processing capability and hence lost production. HRL was asked to determine the root cause of this failure and to prepare and implement a welding repair. HRL was required to use its engineering and metallurgical capabilities to inspect the cracked pipe to determine the failure mechanism and the best method to repair the pipe in a timely fashion. HRL's mechanical engineers and metallurgists were sent to site to determine the cause of failure. Various techniques were employed to examine the failure including ultrasonic testing to determine crack depth and magnetic particle inspection looking at any secondary cracking in neighboring locations. On site replication was used to determine the type of cracking found. The failure mechanism was determined to be creep fatigue, a mechanism that is a combination of creep (a high temperature strain dependent process) and fatigue (a repetitive cyclic loading issue). A piping flexibility analysis confirmed that the location of the crack was outside design limits and also indicated one other location where damage could develop (and where damage was subsequently detected). This crack was through wall and extended 60% around the steam pipe. Repair required the design of a suitable pipe support and the development of a welding procedure. 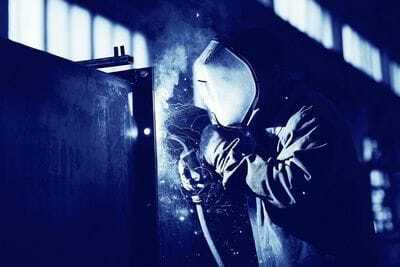 HRL then provided the supervision to ensure the weld repair was undertaken according to the procedure and to the highest practicable standards. The root cause of the failure was determined to be creep fatigue and that the extent of the crack necessitated a major weld reinstatement. HRL's supporting piping flexibility analysis confirmed that the crack location was indeed highly stressed due to a malfunctioning hanger but that there was a second pipe termination weld that was also highly stressed. Subsequent inspection found the beginnings of a crack at this location. The leaking crack required a major repair which was completed in a timely fashion and when non-destructively inspected after post weld heat treatment was found to be free of any significant defects. The ability to combine the failure analysis with the engineering piping flexibility study and weld repair strategy saved the client considerable time, money and concern. As a result of engaging HRL to complete the project, the client was able to confirm that there was merit in moving forward and investing time and money in further product development. Very few organisations have experience in this area, and without HRL expertise, the client may not have known how to proceed. The client was very happy with the work completed and engagedHRL to do a second stage of work, which encompassed a more detailed evaluation of this particular venture.